What are the advantages of including brochure holders in an advertising campaign? The pamphlet displays are designed to dispense leaflets, flyers, and publications of the most common size. 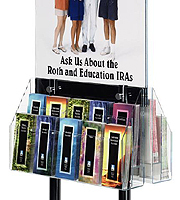 These brochure holders, commonly called trifold literature racks, are designed to showcase standard 4"w x 9"h in all sorts of locations. 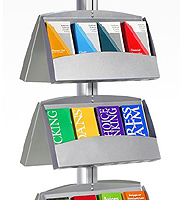 The leaflet dispensers are commonly found at retail shops, restaurants, hospitality centers, travel agencies, doctor's offices and many other places of business. 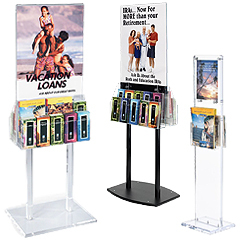 These trifold pamphlet displays, plastic brochure holders feature different exteriors to best match the décor. Retail marketers are free to explore the collection, and choose the design that complements the setting and the contents. The racks are available in acrylic, wood, metal and even cardboard at wholesale price points. Where in the store can these trifold pamphlet displays be installed? 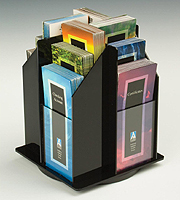 These wholesale brochure holders are ideal choices for advertising on flat surfaces. Place the rack on a tradeshow booth table, retail store cash wrap, reception desk in a doctor's office or most any other space in the store. Each rack has a flat base to remain upright. The countertop designs do not require much space to be effective. There are several floor standing racks available in the collection. 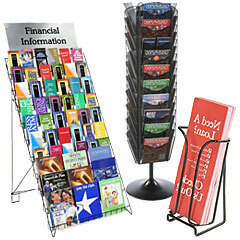 Shop owners set-up these brochure displays at the end of the aisle or near the check-out countertop. The height and size of the unit is hard for customers to miss, which is ideal. This way, users can place all sorts of vibrant leaflets in the stands to garner interest from passersby. These units are ideal when there is plenty of floor space. 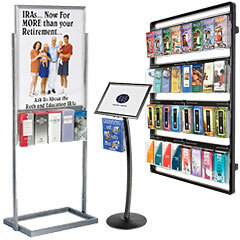 Wall mount racks do wonderful job of advertising to customers at eye-level. Decorate barren walls with the bright and informative flyers. The clear plastic fronts will present the attractive graphics to all passersby. Real estate agents and salesmen often include a special type of wall mount rack in their marketing plan. Weatherproof models allow salespeople to advertise 24 hours a day. Simply mount the pamphlet display to an exterior wall. The sturdy plastic protects the contents from rain, ice, snow and other inclement weather patterns. Promote products even when the building is closed. 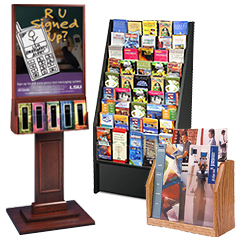 Advertisers can promote leaflets in either a single or multiple pocket brochure display. Each pocket is designed to allow passersby to quickly pluck a flyer from the dispenser box and continue on their way. The holders also provide a sense of organization in the work place. Customers are generally more interested in literature when it is neatly arranged. The displays are certainly a vast improvement from laying pamphlets out on the table or countertop. Managers and employees can set up the dispenser on the desired flat surface to garner interest from the clientele. The holders secure the flyers in the case while keeping the bright graphics in full view. Flyer boxes help the leaflets capture the attention of potential clients and other interested parties. Informing customers is the first step to increasing sales. 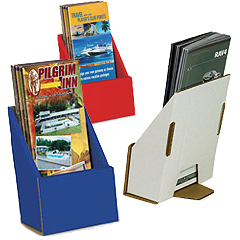 The flyer display boxes are a low cost way to rake in more profits. The leaflet pockets come in many different materials to project the best image for the company. All of these material options combine high quality with competitive pricing. The single pocket displays for trifold information will match the setting and the budget. 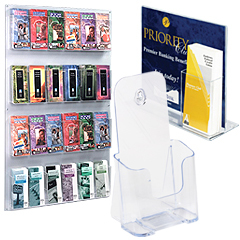 Plastic and acrylic literature racks are some of the most popular. Each design is sturdy, but inexpensive. The modern clear or black color is very appealing. Acrylic and plastic designs also come in multi-pocket designs. Some of these styles have adjustable pockets for accommodating numerous 4"w x 9"h or a couple 8.5"w x 11"h magazines. The molded plastic and acrylic materials are an industry standard. Wooden products offer an elegant touch at a low cost. The wood accent framing is a great touch in certain eateries, upscale hotels, doctor's waiting rooms and other office spaces. These models include an open front, so customers will still be able to see the pamphlets. The wooden frames give the leaflets an extra touch of class at a low price. Advertisers working with a limited budget should consider cardboard racks for their tabletops and countertops. The lightweight models are double corrugated for added durability at a standard cardboard unit price. These pamphlet stands are very simple to set-up and take apart. Tradeshow booth operators and other traveling salespeople can quickly fold the unit flat for convenient storage. These cardboard styles make it easy to take brochures on the road. The corrugated options also come in vibrant colors to capture the attention of all your potential customers. Metal wire is a great material for leaflet boxes. The durable designs have a very sleek exterior. Restaurants, hotels, office lobbies and stores looking to project a modern appearance can take advantage of the metal design. The simple construction allows customers to see the front of the pamphlet and carefully take one. Rubber feet at the base prevent the unit from scratching the countertop.